I simply don’t get brutalist architecture. I’m sometimes embarrassed, as a paid-up member, when the Twentieth Century Society campaigns for a concrete edifice that I’d cheerfully blow up, but there are uncompromising, exciting, post-war concrete buildings that I would miss if they were removed. Perhaps the most startling post-war building I’ve ever seen is the Russian Embassy in Havana (originally, of course, the Soviet Embassy). 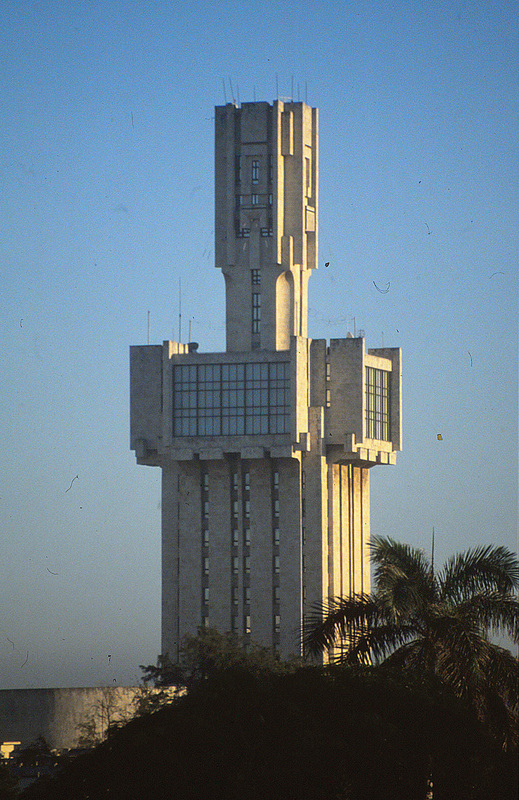 Designed by Aleksandr Rochegov and built between 1978 and 1987, it stands on the Quinta Avenida, or Fifth Avenue, in the Miramar district which was, before the Cuban Revolution, the prestigious residential district of the nation’s capital. There is very little information on the web about this epic piece of concrete, with its gaunt tower protruding above the trees. It’s described as constructivist, rather than brutalist, in style. To me, in my ignorance, the distinction is academic, though students of modern architecture would recognise the two as entirely different concepts. The most coherent example of constructivism I’ve come across, but not yet seen, is the Shukhov Tower in Moscow (1920-1922): https://en.wikipedia.org/wiki/Shukhov_Tower. Yet the Russian Embassy in Havana is so unremittingly ugly that I rather like it. And I’d be sorry to see it go, because it represents a layer in the palimpsest of Cuban architecture, along with the Spanish and American buildings that populate the island representing the stages in its history. This entry was posted in Exploring Cuba on January 29, 2016 by Mike Higginbottom. Allerton Castle, just off the A1 in North Yorkshire, is an ideal place for a wedding, though it’ll cost a bob or two. A dramatic Victorian Gothic pile designed by the little-known London architect, George Martin, for the 19th Lord Stourton, it has a spectacular 70-foot-high great hall, splendid state rooms and a parkland setting. The contents were sold in 1965 when Lord Stourton’s direct descendant, the 25th Lord Mowbray, died, and two successive religious organisations, neither of which proved capable of keeping it up, leased it. When Lord Mowbray’s heir, his grandson Edward, inherited in 1985 he resolved to sell it and it was spotted, fortuitously, by the vice-president of the Tandy Corporation, Dr Gerald Rolph, who was driving north to go shopping for a Scottish castle. Dr Rolph inspected Allerton Castle in the morning and bought it the same afternoon. 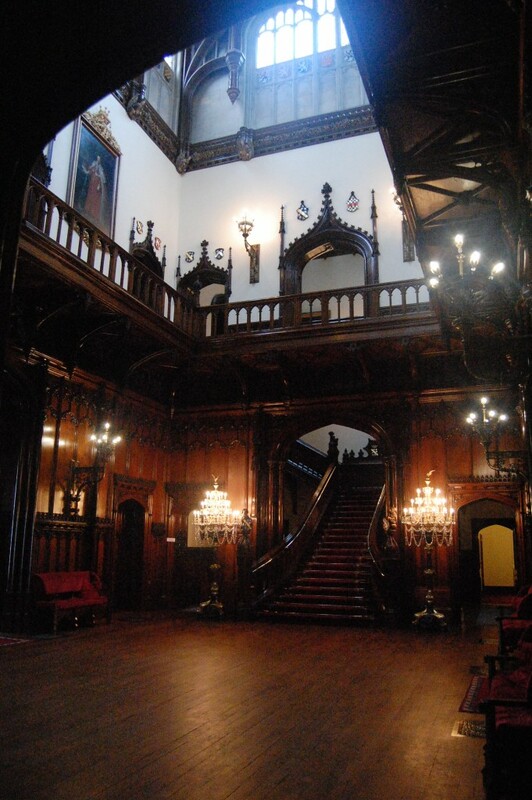 He then spent twenty years carefully restoring the building, replacing the roof, rewiring, and filling the place with furniture, some of it original to the house. In January 2005 a chimney fire spread into the roof void, gutting most of the principal rooms. The 5,000-gallon water tank cracked and the resulting flood saved the Conservatory and part of the Library. Dr Rolph, reasoning that if the place could be restored once it could be restored twice, promptly set about a renewal programme which was completed in 2012. Much of the carving in both wood and marble and the plasterwork was completed in China, using fibreglass moulds of originals as templates. Other work was sourced locally: armorial stained glass was restored or replicated by Paul Lucker of Elland and the wood-carving in the conservatory was carried out by Julie Meredith of York. Dr Rolph designed and commissioned other reproductions including the Bucharest-made Persian-style hand-tied carpet for the Great Hall and the carpets in the Morning Room and the Dining Room. For the Library the Pugin wallpaper was printed from the original blocks by Cole of London and the carpet was designed by Dr Rolph and manufactured by Mercia Weavers. You can visit Allerton Castle on Wednesday afternoons and Bank Holiday Monday afternoons from Easter Monday through to the end of October 2016, though you see rather more of the place (and enjoy a sumptuous afternoon tea) on special tours that run on specific dates through the year: http://www.allertoncastle.co.uk/visiting.html. Or you can hire the whole place if you have enough cash. This entry was posted in Country Houses, Country Houses of North Yorkshire, Victorian Architecture on January 22, 2016 by Mike Higginbottom. 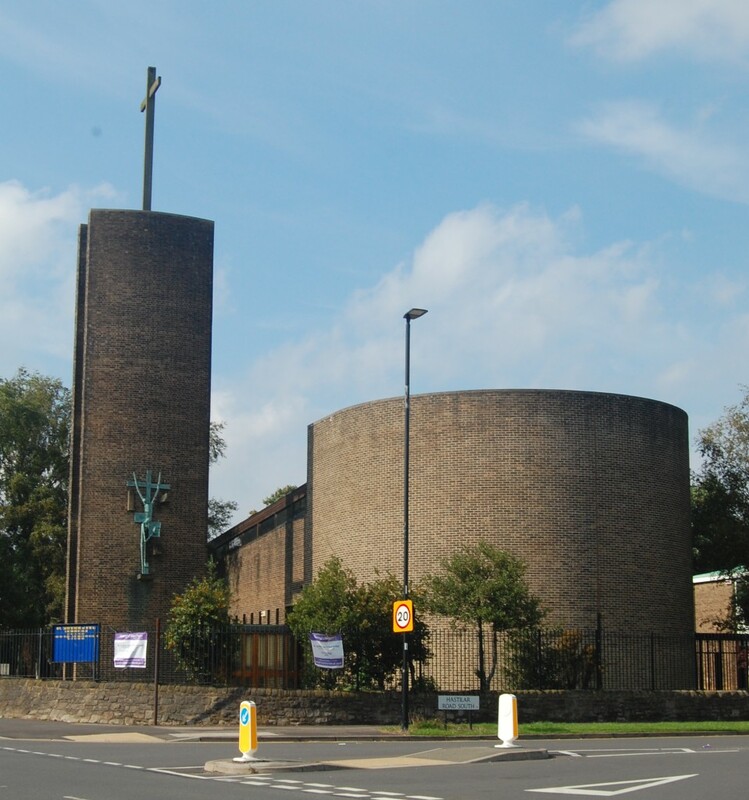 On the strength of his commission for St Paul’s, Wordsworth Avenue, Basil Spence was invited to design a parish church with an attached church hall for the parish of St Catherine of Siena, serving the eastern estates of Richmond and Woodthorpe. This building was also financed by the compensation payments for bombed inner-city churches – of St Philip, Shalesmoor (1828, demolished 1952) and Christ Church, Attercliffe, (1826, demolished 1953). The foundation stone was laid on April 11th 1959 and the church was consecrated by Bishop Leslie Hunter on December 5th the same year. Like St Paul’s, Wordsworth Avenue, St Catherine’s is marked by a tower consisting of two brick pillars, surmounted by a cross, linked by a glazed sacristy corridor to a plain cavity-wall brick nave. At St Catherine, however, the tower slabs are concave and the nave is lit by narrow slit windows and ends in a windowless semi-circular apse. The roof consists of laminated timber beams, separated from the walls by a glazed clerestory and a concealed window that lights the sanctuary providing an atmosphere of well-lit privacy. Basil Spence’s perspective of the proposed design, dated April 1957, shows the original intention to orientate the church north-south with the tower to the east. The sequence of drawings indicates that in March or April 1958 the decision was taken to realign the church geographically, as well as liturgically, east-west, with the tower to the south. A glazed screen at the back of the nave, with the organ mounted above the doorway, separates the nave from the community areas which are integral to the design and follow a pattern that Spence had set in designing three churches for the Diocese of Coventry in 1954. Ronald Pope’s sculpture of St Catherine holding the burning heart before the crucified Christ was placed on the eastern face of the bell-tower and dedicated by Bishop Francis John Taylor on February 13th 1966. The church was listed Grade II in 1997 for its “strongly sculptural design with a powerful presence”. This entry was posted in Sacred Places, Sheffield's Heritage on January 16, 2016 by Mike Higginbottom. After Basil Spence (Sir Basil from 1960) won the competition to rebuild the bombed Coventry Cathedral in 1950 he became one of the architects to go to for parish church designs, particularly on new housing estates. Bishop Gorton of Coventry invited Spence to design three new suburban churches, St Oswald, Tile Hill, St Chad, Wood End, Henley Green and St John the Divine, Willenhall (all three opened 1957); in Leicester, Bishop Williams, explicitly on the recommendation of Neville Gorton, commissioned St Aidan’s, New Parks (1959); in Sheffield, Spence designed two elegant modern parish churches on opposite sides of the city. Partly funded by the compensation payments for two bombed churches, St James’ in the city centre and Emmanuel, Attercliffe, St Paul’s, Wordsworth Avenue, was built to serve the community that came to live in a post-war extension of the Parson Cross housing estate that Sheffield Corporation had laid out north-west of the city in the late 1930s. His design has two conjoined elements. What looks like a tower is actually two brick pillars surmounted by a cross, and the aisleless nave consists of two parallel brick side walls above which floats the shallow barrel-vault roof. The double-glazed clerestories and the glass screen end walls bring light into the building: they were also cheaper and quicker to construct. Ove Arup & Partners designed the diaframe bracing of the roof reminiscent of Gothic vaulting and serving the same purpose. The pews were designed by Basil Spence and made of agba, an African mahogany now endangered and in short supply. The organ, bought from Mount Tabor Methodist Church, Hoyland, and installed in 1962, is mounted on the west gallery. An African teak slatted screen behind the altar gives privacy to the congregation while making services apparent to the outside world. As the church website remarks, the glazed ends “prevent the worship of the church being a secret from the community or the worshippers being unaware of what is going on in the area”. Basil Spence gave the altar candlesticks of hammered iron, and the green appliqué altar frontal was made in 1958 by Beryl Dean (1911-2001) to the design of Anthony Blee, Basil Spence’s son-in-law. The church silver includes a chalice and paten by the Sheffield silversmith Omar Ramsden (1873-1939). The total cost was around £30,000. The English Heritage Grade II* listing description describes St Paul’s as “an unusually transparent design and Spence’s best small church”. This entry was posted in Sacred Places, Sheffield's Heritage on January 10, 2016 by Mike Higginbottom. Key West is beguiling. It’s an island about four miles long and hardly a mile wide. The southern tip is the Old Town, a gridiron of the most charming wood-framed clapboard houses with verandas, ornate woodwork they call gingerbread, and often a rooftop balcony belvedere they call a “widow’s walk”. 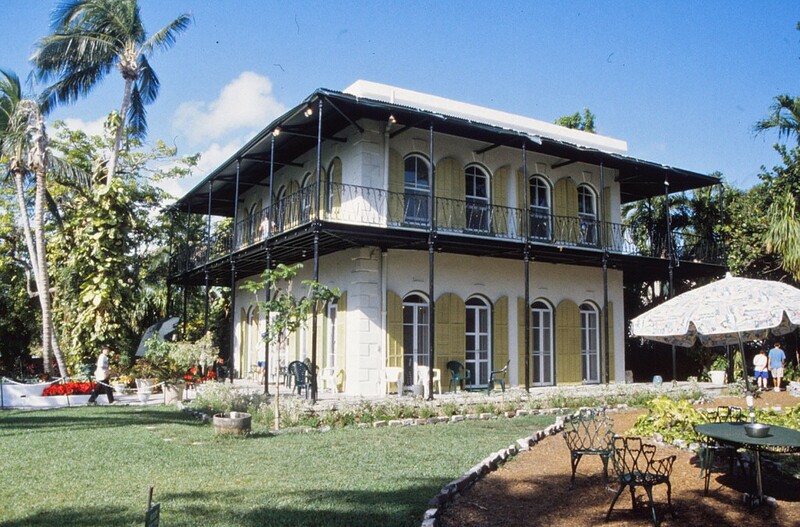 The Ernest Hemingway Home & Museum [http://www.hemingwayhome.com], was the writer’s home from 1931 to 1939 where he wrote ‘The Snows of Kilimanjaro’ (1936) and To Have And Have Not (1937). Built in 1851, the house became one of the first on the island with indoor plumbing supplied by rainwater, was certainly the first with an upstairs plumbed bathroom and in the 1930s had the only swimming pool within a hundred miles, a huge and impractical installation. The place is still inhabited by descendants of the polydactyl cats which Ernest Hemingway kept. Directly opposite the Hemingway home is the Key West Lighthouse [http://www.kwahs.org/visit/lighthouse-keepers-quarters], completed in 1848 after its predecessor was destroyed by a hurricane, and heightened by twenty feet in 1894 because of encroaching buildings and trees. It was decommissioned in 1969 and now serves as a museum and vantage point. Also on Whitehead Street is the Audubon House and Tropical Gardens [http://audubonhouse.com], commemorating the 1832 visit of the famous ornithologist John James Audubon (1785-1851). The so-called Geiger Tree in the front garden features in the Birds of America image of the white-crowned pigeon. Other historic sites in the Old Town include the former Old Post Office & Custom House (1891) [http://www.kwahs.org/visit/custom-house], which now houses the Key West Museum of Art & History, and the Richard Peacon House (c1885), an example of the distinctive American octagon house, a mid-nineteenth century device for increasing indoor floor-area in a narrow rectangular urban plot. Within the naval base Fort Zachary Taylor (1845) is the historic Truman Annex or Winter White House [http://www.trumanlittlewhitehouse.com], built as officers’ quarters in 1890, where the post-war President Harry S Truman stayed on eleven separate visits for a total of 175 days during his presidency from 1945 to 1952. He was the first president to take full advantage of modern communications to work remotely from Washington DC. The Mel Fisher Museum [http://www.melfisher.org] on Greene Street illustrates aspects of Keys history which would be otherwise invisible. Mel Fisher (1922-1998) was a diver and treasure hunter who, after years of persistence, located the wreck of the Nuestra Señora de Atocha, a Spanish treasure galleon that sank off the Florida coast in 1622. Mel Fisher identified the site in July 1985 and recovered a breath-taking array of gold, silver and emeralds. On Christmas Eve I watched the sunset from Mallory Square – contemplating the fact that my Sheffield friends would at the same moment be trudging between pubs in the cold and wet. There’s a lot to be said for Christmas in a T-shirt. This entry was posted in Life-enhancing experiences on January 4, 2016 by Mike Higginbottom.